ICF stands for Insulating Concrete Form. It is an energy efficient building method which creates insulated structural walls for residential and commercial buildings. Imagine stacking giant, hollow, steel reinforced Lego blocks made from Expanded Polystyrene (EPS) to create the exterior walls of your house. Once you’ve finished joining them all together, then fill the cavity inside the Lego blocks with concrete and wait for it to solidify. You’ve just completed the building envelope of your project in one step! That’s basically the principle behind ICF. However, the reality is that this system of manufacturing walls has many advantages over traditional methods. The EPS acts as a rigid thermal insulation that stays in place either side of the concrete core. ICF construction has become a great, energy efficiency solution for new builds. It is also useful in areas with natural disaster-resistant building codes. ICFs may be used with frost protected shallow foundations (FPSF) too. Since the 1970s, ICF adoption as a construction method has steadily increased, although factors such as a lack of awareness, overly restrictive building codes, and manufacturers causing confusion by selling slightly different ICF designs have slowed its outreach. In the developed world, ICF construction is now accepted as a reliable method of construction in most jurisdictions. Why is it a good method? Air leaks are minimised, reducing heat loss and improving comfort. Improved energy saving compared with uninsulated masonry as heat put into the building stays in the building longer. ICF walls can have a four- to six-hour fire resistance rating and negligible surface burning properties. Up to ten times stronger than wooden framed structures. The structural integrity of ICF provides better resistance to the forces of nature. Rot-proof materials, even when wet. Beneficial results when used in high seismic risk zones. Humidity levels are better regulated because they are generally constructed without a plastic sheet vapour barrier. More comfortable interior whilst still maintaining a high thermal efficiency rating. ICF walls have much lower rates of acoustic transmission. Wall thickness, mass, component materials and air tightness all combine to provide better sound absorption. There are no gaps for insects, vermin and pests to exploit as an entrance into the property. The entire structure provides a much more challenging barrier to insects and vermin. Whilst ICF is a great idea for the internal structural support of a building, it needs to be clad in an external product that looks attractive; adds thermal value if required; can add more fire retardancy if local building regulations or environmental factors dictate; and are fast to install and cost effective versus traditional methods. This is where the entire Monolith range adds value to the exterior of your ICF project. They can all be adhered directly onto ICF substrates. 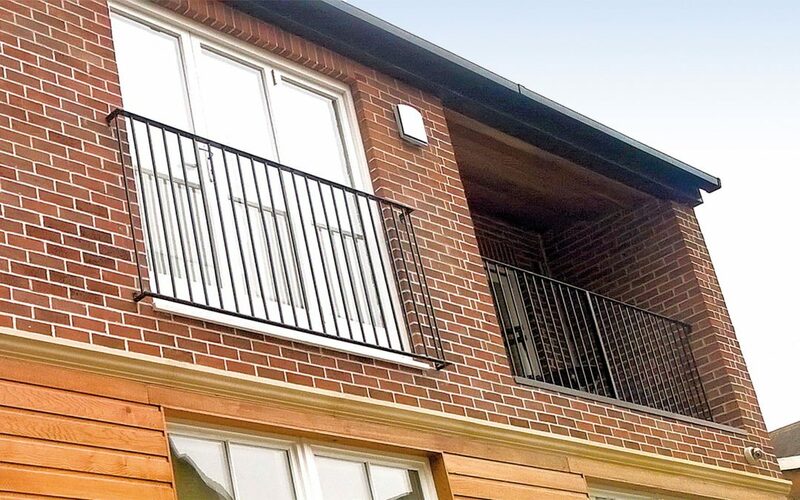 All of our products are designed to complement ICF projects, and are fast becoming the go-to range for forward-thinking planners, architects and self-builders. BrickPlus: Eco is one of our most popular products for ICF buildings as it adds thermal value to a project. It consists of twelve of our BrickPlus: EcoSlip products which are bonded to lightweight, fire retardant, high grade EPS panels. This forms a system of interlocking devices that can dramatically increase the speed that a brick slip wall can be covered. In conclusion, we feel that our entire range of products is ideally suited to ICF properties – large or small. Whatever you have in mind, contact us to see how we can add value to the exterior of your build. Email us on orders@monolith.build or call 01745 535 855.